Ride single speed MTB? So do a lot of PG Racing team members! 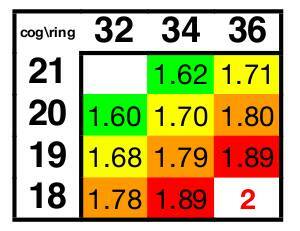 John Draskovic made this helpful chart to cover most ratios used for 29ers in Ohio. 32×19 (with 29x~2.1-2.2) is the most common ratio used by PGers. Dirk Kostoff races a 34×21. Tom Draskovic has raced a 32×19. John Caughell races a 32×19. Taylor Kruse raced a 32×18 on the Tour Divide, but uses 32×19 for XC. Dan Monnig and John Draskovic use 32×20 and a 32×19.